We're back again for our 3rd Annual Brady Henricks FootGolf Tournament. Kick off summer vacay with us and enjoy live music, food & fun for the whole family! In honor of our friend and longtime Lonestar player, Brady, who passed away unexpectedly in 2016, we have dedicated this tournament in memory of his love for the game. At the request of the Henricks family, 100% of donations and proceeds raised will go to the Brady Henricks Scholarship Fund, which was set up to help players who otherwise could not afford to play, in the hopes of changing lives through the game Brady loved. a game played on a golf course in which a soccer ball is kicked into a series of large holes, the object being to complete the course using the fewest possible shots: she plays a round of footgolf. a fun, fast-growing sport that combines the best elements of soccer & golf! Gather a team (max 4) & test your foot skills to earn points & win prizes! 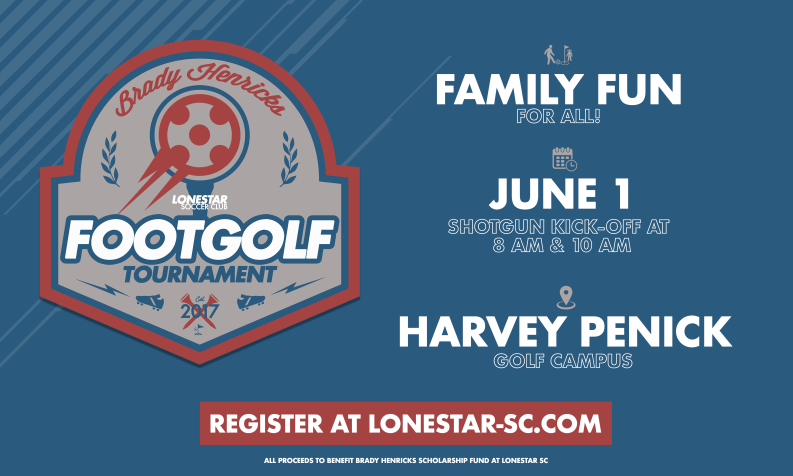 Saturday, June 1 at Harvey Penick Golf Campus. Select your tee time - 8:00 am or 10:00 am. Anticipate a 2 hour round of play! $30 per player, $120 for team of 4 - Includes breakfast, soccer ball, swag bag, t-shirt & round of golf. Wear active apparel & indoor soccer or tennis shoes - No cleats or bare feet. Two or more players form a team, with the rules emphasizing fun without the pressure of players keeping individual scores! Each player kicks a shot on each hole, but everyone plays from the spot of the best shot. Learning footgolf rules beforehand will only enhance your experience! In addition to LIVE music, swag bag, t-shirt, bragging rights, yummy snacks & drinks, the prizes are rocking! Be a part of our mission to provide all kids positive life-changing opportunities through soccer and join us for a day of footgolf, live music, interactive experiences and giving back at the 2019 Brady Henricks FootGolf Tournament. The Lonestar Financial Aid Program was created with the idea that every child who desires to play soccer has the opportunity for success, not only on the field, but in life as well. Research has proven that children who participate in team sports have lower drop-out rates, lower occurrences of substance abuse, higher grades in the classroom, and higher levels of character development and self-esteem. The impact of participating in athletics is obvious and important in shaping the youth of our community! The Lonestar Financial Aid Program benefits over 500 families at all levels of play with nearly $500,000 distributed during the 2018-19 season alone. None of this is possible without our sponsors and donor fundraising efforts. Your support of the Brady Henricks Scholarship Fund will help ensure we never turn a child away from playing soccer! Lonestar Soccer Club is a 501(c)3 Non-Profit Organization, Tax ID #20-1201450. All donations are tax-deductible.